Other information about your health and activities (collectively, “Personal data”). You will also have an option to permit us to import into the App data from third-party services such as Apple HealthKit and Google Fit, among others. Such imported information may include: sports activities, weight, calories burnt, heartbeat rate, number of steps/distance travelled, and other information about your health. Device Information: We collect information about the mobile device you use to access the App, including the hardware model, operating system and version, unique device identifiers and mobile network information. Location Information: We collect your IP address, time zone, and information about your mobile service provider, which allows us to infer your general location. Information Collected by Cookies and Other Tracking Technologies: We use various technologies to collect information about your use of the App, such as frequency of use, which areas and features of our App you visit and your use patterns generally, engagement tracking with particular features, etc. To collect this information, we may send cookies to your mobile device or computer. Cookies are small data files stored on your hard drive or in device memory. II. PERSONAL DATA YOU PROVIDE TO US THROUGH THE ACCOUNT CREATION PROCESS INCLUDES PERSONAL DATA YOU ENTER INTO THE APP, SUCH AS YOUR ACCOUNT DATA (E.G. YOUR NAME AND EMAIL ADDRESS), AND YOUR HEALTH DATA (E.G. BODY MEASUREMENTS, PHYSICAL ACTIVITY AND OTHERS). DEPENDING ON THE DATA YOU PROVIDE, IT MAY ALSO CONTAIN INFORMATION ABOUT YOUR GENERAL HEALTH (E.G. WEIGHT, BODY TEMPERATURE, AND OTHERS). PLEASE NOTE THAT WE WILL NEVER SHARE YOUR EXACT AGE OR ANY DATA RELATED TO YOUR HEALTH WITH ANY THIRD PARTIES. We will not use the information gained through your use of the HealthKit and Google Fit framework for advertising or similar services, or sell it to advertising platforms, data brokers, or information resellers. You are able to modify, correct, erase, and update your Personal Data by writing us at support@flo.health. You have a right to access your Personal Data you insert into the App and ask us about what kind of Personal Data we have about you. You can do this by using the app settings or by writing us at support@flo.health. Access to your Personal Data and Data Portability. The App gives you the ability to access and update Personal Data within the App and your account settings. You shall have the right to request information about whether we have any Personal Data about you, to access your Personal data (including in a structured and portable form) by simply writing us at support@flo.health. Erasure of your Personal Data. If you believe that your Personal Data is no longer necessary in relation to the purposes for which it was collected or otherwise processed, or in cases where you have withdrawn your consent or object to the processing of your Personal Data, or in cases where the processing of your Personal Data does not otherwise comply with the GDPR, you have right to contact us and ask us to erase such Personal Data as described above. You can simply write us at support@flo.health. Please be aware that erasing some Personal Data inserted by you may affect your possibility to utilize the App and its features. Erasure of some Personal Data may also take some time due to technical reasons. Right to object processing of your Personal Data. You can object processing your Personal Data and stop us from processing your Personal data, simply write us at support@flo.health. Please be aware that erasing some Personal Data inserted by you may affect your possibility to use the App and its features. Notice about automated decision-making. We use automated decision-making tools (e.g. neural networks) that process your Personal Data in order to provide you proper Services (for example, predictions of your cycle). Normally, such automated decision-making works more precisely, if you insert more Personal Data about your cycle, symptoms, physical activities that our neural networks can work with. Our neural networks process this information in order to track particular dependencies and correlations in your cycles and symptoms and provide you more personalized information about your cycle and its predictions. Notification requirements. We commit to notify you within reasonable period of time and your data protection authority within the timeframe specified in applicable law (72 hours) about any personal data breaches in the App. Following the provisions of GDPR we might also require you to prove your identity (for example, by requesting an ID or any other proof of identity) in order for you to invoke the mentioned rights, specifically if you exercise them in respect to special categories of Personal Data like data about health. This is made to ensure that no rights of third parties are violated by your request, and the rights described in this section are exercised by an actual Personal Data subject or an authorized person. Please note that we will grant your request within 30 days after receiving it, but it may take us up to 90 days in some cases, for example for full erasure of your Personal Data stored in our backup systems — this is due to the size and complexity of the systems we use to store data. ALL USERS. Provided we receive your consent as appropriate under applicable law, we may share some of your Personal Data with AppsFlyer, a mobile marketing platform. By using AppsFlyer and its integrated partners we are able to reach more people like you and spread the word about the App to help more women to stay in control with their health and wellbeing. Read more about AppsFlyer here and its integrated partners here. 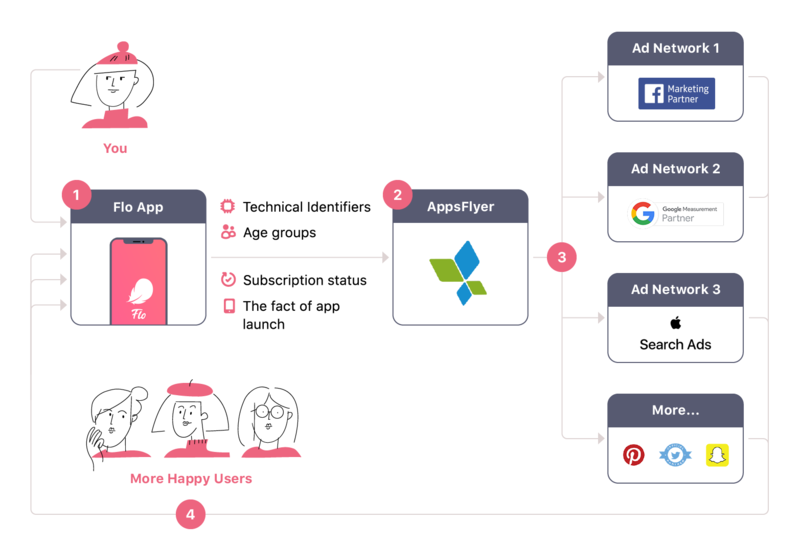 To accomplish the above-mentioned goal, we may share certain Personal data with AppsFlyer and some of its integrated partners as indicated below. a) Technical identifiers: IP address (which may also provide general location information), User agent, IDFA (Identifier for advertisers), Android ID (in Android devices), Google Advertiser ID, Customer issued user ID and other similar unique technical identifiers. d) The fact of application launch. Flo App sends your data to AppsFlyer, which analyzes it and provides us reports and insights on how to optimize our promotional campaigns. At the same time, AppsFlyer sends your data to some of its integrated partners (e.g. Pinterest, Google Ads, Apple Search Ads, FB marketing network, and a couple of others) to find people like you on different platforms, including social media websites. These integrated partners analyze your data (so-called “custom audience”) and show relevant information about the App to people who might be potentially interested in it (so-called “lookalike audience”). This is how you contribute to the growth of Flo community. The more people find out about Flo, the more of them get accurate cycle predictions, learn about the meaning of their bodies’ signals and receive credible information about their health. It all happens thanks to you and your consent to use Flo app. Facebook Lookalike Audiences. We utilize Facebook advertising service called “lookalike audiences” to identify potential new Flo users on Facebook based on the information from the existing Flo users. We use the service to identify people on Facebook who might like Flo as much as our current users do. Snapchat. Snapchat is a popular social network, and we utilize its targeting features to reach more people on Snapchat like our users. See more about Snapchat privacy settings here. Flo App sends your data to Facebook Lookalike audience service and Pinterest to find people like you on these platforms. 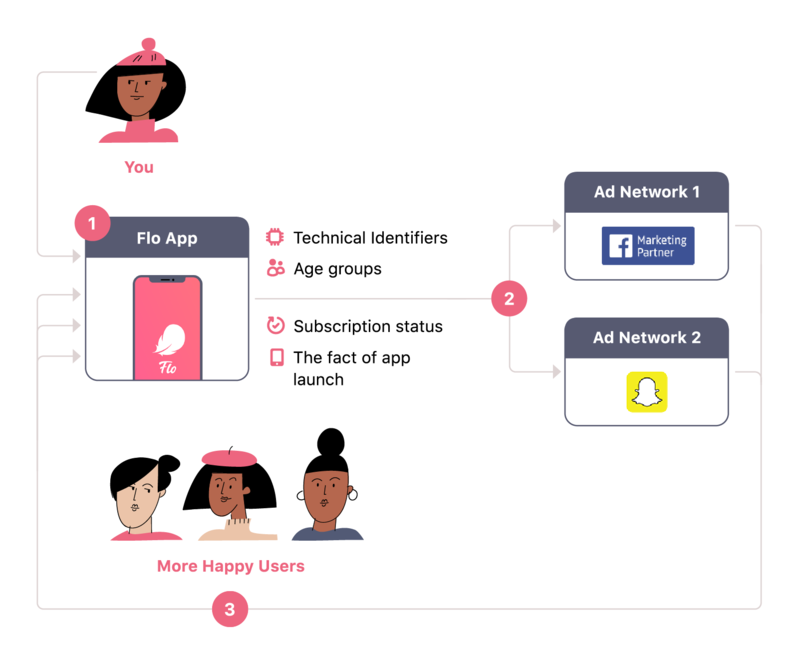 These third-party services analyze your data (so-called “custom audience”) and show relevant information about the App to people who might potentially be interested in it (so-called “lookalike audience”). BY USING APPSFLYER’S OPT-OUT/FORGET MY DEVICE OPTION HERE. Aggregated Information. We may share aggregated, anonymized or de-identified information, which cannot reasonably be used to identify you, including with our partners or research institutions. For example, we may share, including, without limitation, in articles, blog posts and scientific publications, general age demographic information and aggregate statistics about certain activities or symptoms from data collected to help identify patterns across users. Information Posted by User. The App features several community areas and other public forums where users with similar interests or medical conditions can share information and support one another or where users can post questions for experts to answer. We also offer online discussions which may be moderated by healthcare experts. Our communities are open to [the public/the App community] and should not be considered private. Any information (including Personal Data) you share in any online community area or online discussion is by design open to the public and is not private. You should think carefully before posting any Personal Data in any public forum. What you post can be seen, disclosed to, or collected by third parties and may be used by others in ways we cannot control or predict, including to contact you for unauthorized purposes. As with any public forum on any site, the information you post may also show up in third-party search engines. If you remove data from your account, you will no longer see it in the App, but some backups of the data may remain in our archive servers for a reasonable period of time due to technical solutions we use. However, we undertake to delete any such backups within a reasonable period of time. If you choose to delete the App, deactivate your account, we retain your Personal data for as long as your account is active and a reasonable period thereafter in case you decide to re-activate the Services. We also retain some of your information as necessary to comply with our legal obligations, to resolve disputes, to enforce our agreements, to support business operations, and to continue to develop and improve our Services. Where we retain information for Service improvement and development, we take steps to eliminate information that directly identifies you, and we only use the information to uncover collective insights about the use of our Services, not to specifically analyze personal characteristics about you. We take reasonable steps in order to ensure compliance of such third parties with any applicable laws that might govern processing of your Personal Data. For example, for the EU residents’ Personal Data we make reasonable efforts to ensure that such third parties are GDPR compliant and have GDPR compliant privacy policies in place. Organizational and legal measures. For example, our employees have different levels of access to your Personal Data and only those in charge of data management get access to your Personal Data and only for limited purposes required for the operation of the App. We impose strict liability on our employees for any disclosures, unauthorized accesses, alterations, destructions, misuses of your Personal Data. Conducting periodical data protection impact assessments in order to ensure that the App fully adheres to the principles of ‘privacy by design’, ‘privacy by default’ and others. We also commit to undertake privacy audit in case of Company’s merger or takeover. We process information in a way that is compatible with and relevant for the purpose for which it was collected. To the extent necessary for those purposes, we take reasonable and appropriate steps to ensure that any information in our care is accurate, complete, current and reliable for its intended use. General age limitation. We are committed to protecting the privacy of children. The App is not intended for children and we do not intentionally collect information about children under 13 years old. The App does not collect Personal Data from any person the Company actually knows is under the age of 13. If you are aware of anyone under 13 using the App, please contact us at support@flo.health and we will take required steps to delete such information and (or) delete her account. Age limitation for EU residents. Due to requirements of the GDPR you shall be at least 16 years old in order to use the App. To the extent prohibited by applicable law, we do not allow use of the App by the EU residents younger than 16 years old. If you are aware of anyone younger than 16 using the App, please contact us at support@flo.health and we will take steps to delete such information and (or) delete her account. We may contact you from time to time via email to communicate with you about products, services, offers, promotions, rewards, and events offered by us and others, and provide news and information that we think will be of interest to you. You can always opt out of receiving emails by unsubscribing via the “Unsubscribe” link contained in the email. Opting-out of these emails will not end transmission of important service-related emails that are necessary to your use of the App. If applicable laws prescribe so, certain exclusions may apply to the residents of some countries regarding an active opt-in for any email communications from us. We may ask such users at the registration screen to provide their consents for any such communications. General. The Company is based in the United States and the information we collect is governed by U.S. law. Please be advised that U.S. law and laws of other countries may not offer the same protections as the law of your jurisdiction. In addition, you agree that information collected through the App may be stored and processed in Canada, where the Company rents servers, or in any other country in which the Company or its affiliates, subsidiaries or agents maintain facilities, and by using the App, you consent to any such transfer of information outside of your country. EU and Swiss residents. Please bear in mind that we may transfer your Personal Data to the United States which data protection is not deemed adequate under applicable data protection law. We have further committed to refer unresolved Privacy Shield complaints to JAMS, an alternative dispute resolution provider located in the United States. If you do not receive timely acknowledgment of your complaint from us, or if we have not addressed your complaint to your satisfaction, please contact or visit the following link for more information or to file a complaint. The services of JAMS are provided at no cost to you. Arbitration. You may also be able to invoke binding arbitration for unresolved complaints but prior to initiating such arbitration, a resident of a European country participating in the Privacy Shield must first: (1) contact us and afford us the opportunity to resolve the issue; (2) seek assistance from JAMS; and (3) contact the U.S. Department of Commerce (either directly or through a European Data Protection Authority) and afford the Department of Commerce time to attempt to resolve the issue. If such a resident invokes binding arbitration, each party shall be responsible for its own attorney’s fees. Please be advised that, pursuant to the Privacy Shield, the arbitrator(s) may only impose individual-specific, non-monetary, equitable relief necessary to remedy any violation of the Privacy Shield Principles with respect to the resident. The arbitration option may not be invoked if the individual’s same claimed violation of the Principles (1) has previously been subject to binding arbitration; (2) was the subject of a final judgment entered in a court action to which the individual was a party; or (3) was previously settled by the parties. U.S. Federal Trade Commission Enforcement. Our Privacy Shield compliance is subject to the investigatory and enforcement powers of the U.S. Federal Trade Commission (FTC). To communicate with our Data Protection Officer, please email at dpo@flo.health.